In the beginning there was man and women, and it was man that made the wheel. So that he may ride on wheels, man then made the bicycle to impress the woman. Then the very next season, there were new shifters and brakes on the market, and all the man’s wheels were totally useless and the women was unimpressed. And the man lamented that he must either live in the past or say goodbye to his treasured wheels. The end. And that’s the story for 2013. There are so many changes occurring in road wheel design (setting aside the 26/650B/29 issues of mtb) and a lot of these changes will complicate your future bicycle and component purchases. For road bikes, the issues come down to rim type, cassette bodies, and disc brakes. The question of tubeless road tires and rims/wheels have been simmering for a few years, but the latest component groups from Shimano and SRAM, requiring wider cassette bodies, has wheel manufacturers scrambling to produce 11sp compatible hoops for both OEM and retail sales. And then disc brakes for road bikes are on the way too. 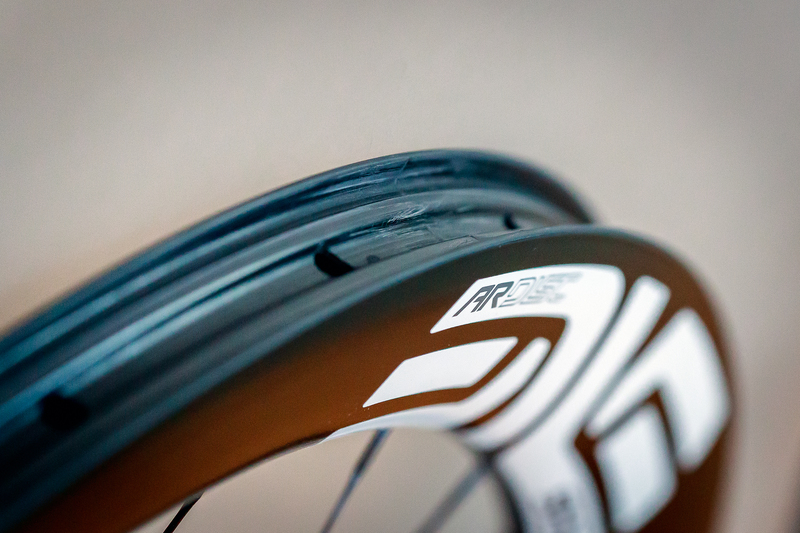 First, road tubeless tires have been creeping into market insidiously for several years now. After all the hype that followed Hutchinson’s road tubeless debut, it seemed for a moment that tubeless would take over the performance road market as it had for mountain bikes, but initial tubeless choices were quite limited and market acceptance was slow. At first only a couple manufacturers made tubeless ready wheel systems, but now tubeless is widespread among high-end wheelmakers. Recently, tire quality and choices among brands have improved greatly. Some riders, who would otherwise not be interested in major equipment purchases, are still keen to give tubeless a try were it not for the wheel compatibility issue. Though some consumers have had success fitting older rims with tubeless conversion kits, the resulting setups often require some savvy to make work. Mainstream riders expect the system integration approach rather than a pastime of tinkering with leaking tires. The purpose-built, tubeless-ready wheels and rims make installation a sure thing; paradoxically, their rim shape makes mounting standard tires with tubes far more difficult. It is annoying enough that I would not buy a tubeless-ready road wheel unless I was sure I’d almost always run it as tubeless, which has been a difficult wager to make given the paucity of tire choices up until recently. Tubeless for the road will likely continue to grow at a steady rate for the foreseeable future, but the market has totally revamped product now that SRAM and Shimano’s top- and mid-range component groups have gone to 11sp. For 23 years, the 8sp Hyperglide cassette body was all you needed to run whatever cassette you wanted, but the new 11sp cassettes from SRAM and Shimano are too wide though they use the same old Hyperglide spline pattern. If you run Campagnolo 9/10/11-compatible wheels, this conversation doesn’t really involve you. Campagnolo revamped their hub and cassette body design back in the late-1990s when they tooled up for 9sp. Campagnolo’s 9sp spacing was slightly wider than Shimano’s version; the next two generations of Campagnolo drivetrains (10sp circa 2003; 11sp circa 2008) kept that same cassette width. The 11sp version of Campagnolo cassettes has the last cog dished over the hub flange slightly. With their own 11sp, Shimano finally widened the total cassette to a dimension almost identical to Campagnolo, though the spline patterns are still incompatible. And whatever cog/cassette standards that Shimano creates, SRAM adopts as theirs. Oddly enough, Campagnolo and Shimano/SRAM shifters/derailleurs can take the same 11sp cogsets, whereas the last time that was truly possible was the 7sp-era, when freewheels were the norm (swapping cassette wheels with respective 8/9/10sp cogs is a sloppy substitution. So Shimano/SRAM 11sp users may be able to use existing Campagnolo-compatible wheels with 11sp Campagnolo cassettes in their otherwise SRAM or Shimano drivetrain. However, if you don’t have those Campagnolo-compatible wheels lying around, I wouldn’t recommend paying good money just to get them. Anyway I look at it, this cross-compatible cog spacing benefits Campagnolo-users more long-term than those with Shimano/SRAM-compatible wheels. SRAM and Shimano cassettes always have better availability and pricing compared to Campagnolo; now Campagnolo fans can use those cassettes with all the new wheels on the market that are 11sp compatible for Shimano/SRAM cassettes. What about just using a (non-Campag) 10sp wheel and cassette with an 11sp drivetrain? Well, 10 and 11sp cassettes do not have the same cog-to-cog spacing and would not give good shifting even if it seems to work within reason in the stand. But you may be able to remove the 1st position cog of an 11sp cassette, and then fit that to a 10sp-sized hub. The 1st position cog is always 11T on an 11sp road cassette; so if you can live with a 12T as your top end, then this might be a workable setup. Removing any other cog in the cassette is usually impossible because the cogs are mounted in clusters, or at least undesirable since removing a cog from a sequence misaligns the shift gate teeth and alters the overall profile of the cassette. You’ll need to get a 12T lockring to hold on the cassette, as the stock 11T-sized lockring might not bite as effectively on the larger cog. The reduced 11sp cassette also is a little bit narrower than an actual 10sp cassette, so you’ll also need a thin spacer behind the reduced cassette so that the lockring will cinch up tight. I have had success with a SRAM Red22 conversion with older wheels. I do have my reservations because the 11sp shifters would need to be locked out of their last index click, via the limit screws of the rear derailleur. Accidentally attempting to downshift past the last cog might put excess stress on the shifter over time, and I particularly suspect that SRAM levers will be more vulnerable than Shimano mechanical levers. I would think that the Shimano Di2 levers would work flawlessly in such as setup. There is a good chance that if you own Mavic road wheels less than 15 years old, they will fit those 11sp SRAM/Shimano cassettes. When Campagnolo debuted their 9sp drivetrain with a totally new spline pattern, very few manufacturers could supply a compatible wheel. Mavic’s cassette body design couldn’t be redesigned to fit the deeper Campagnolo splines without considerable redesign to the overall wheel, but it could be a made a little wider with minimal effort. Mavic then sold their own cassette consisting of a selection of individual cogs and different spacers to create 8 or 9, Shimano or Campagnolo spacing. When Mavic introduced the Ksyrium SSC wheel system, the rear hub featured the FT-SL freehub, which could be quickly swapped between Shimano or Campagnolo splined bodies. The Shimano-spline body kept the extra width to be used with those special Mavic cassettes, but within a few years Mavic gave up trying to produce drivetrain components, including cassettes. Since then all Mavic road wheels compatible with Shimano/SRAM cassettes require a small spacer to properly fit an 8, 9, or 10sp cassette. Remove the spacer, and those several generations of Mavic wheel systems are already 11sp-compatible. The other major change in wheel standards, one that is just gathering momentum now, is the disc brake issue. In the next 5-10 years, could the road bike world see a genuine disc brake revolution? While the 2014 SRAM Red22 is the first component group to feature a disc brake option, in mountain bike realms only the entry-level groups even have the option for non-disc brakes and thus non-disc hubs. It is difficult to predict at this point, but I think it foolish to say that a similar thing couldn’t happen to road bikes as well. Much like with standard hubs, disc hubs/wheels for road bikes are going to need to be 11sp-compatible to keep pace with OEM needs as integrated hydraulic brake/shift systems are going to be based on 11sp platforms. With that, virtually no existing mtb hubs or mtb-based wheel system is suitable. For instance, Easton’s EA90 XD wheelset is marketed to disc road/cyclocross but the 700C disc-brake wheelset uses hubs developed for mtb, which are not 11sp compatible. Another problem is that mtb hubs have an over-locknut-dimension of 135mm, while road hubs have been 130mm OLD since the late 1980s. Disc brakes for road and cyclocross bikes actually first appeared in the mid-00s. Using cable-actuated brakes like the Avid BB7, those bikes had their fans but never really threatened to ignite a revolution. Those mechanical disc brakes were best suited to all-weather touring and commuter use, not quite having the power and modulation of a quality rim brake has in the dry. In the mtb technology, the highest performance disc brakes had always been hydraulic, but fitting hydraulic reservoirs and master cylinders into the integrated shift/brake levers of road bikes is no mean feat. Perhaps integrated hydraulic brake systems might have evolved sooner had not the UCI ruled against disc brakes in international cyclocross events right around that same time. Without a big road disc market demographic to buy integrated hydraulic disc brakes or a top-level sport to market through, manufacturers put their efforts into other areas. Then in 2010, after cyclocross had been steadily growing as a demographic, the UCI reversed their against disc brakes. Three model years later, 2014 is likely to be the first time that manufacturers offer more disc than cantilever models. Most manufacturers have decided that 135mm will be the new standard for road disc, but a few makers are still hoping that 130mm will endure. In the past, a number of bikes were made to take either rim brakes or disc calipers on the same frame. In that case, it would be logical to build the frame with (road standard) 130mm rear spacing to have access to a wide range of rim-brake wheels. The original, alloy Conquest Disc (c.2004) was built this way. The later Trek Portland (c.2008) was a disc-specific frame that also featured 130mm spacing. However, the choices for 130mm disc hubs/wheels has always been horribly small. Ultimately, 130mm disc hubs will be an evolutionary deadend. Redline debuted their carbon cyclocross frameset in 2011 with a disc compatible 130mm rear end; for 2014 the bike comes disc-only and the dropouts feature inserts to allow the rear end to be configured for 130 or 135mm. As a disc-specific frameset, the new Conquest Carbon Disc’s ability to use 130mm hubs could only appeal to someone who has some older disc wheels that they wanted to carry over from a previous bike. All new wheel development has accepted 135mm as the standard for road disc. On the other hand, Orbea’s new Avant series of alloy and carbon road bikes can use rim or disc brakes, and the Avant bikes have 130/135mm modular dropout inserts to best match whatever wheels you want to run. Keeping the OLD for road bikes as 130mm may ease retooling costs in large scale production, but 135mm OLD could have some structural advantages with regards to the wheel. The move to wider, 11sp-compatible cassette bodies has required the hub flanges to be more heavily offset to the left, creating a wheel with more asymmetric spoke angles (dish) and proportionally less strength. Going to 135mm OLD would reduce the asymmetry by 2.5mm, improving the strength of the wheel. By the same token, 11sp wheels for rim brakes would also benefit structurally to going to 135mm, but it is hard to see manufacturers widening road bikes just to strengthen wheels some marginal amount. However, it is plausible that in the future 135mm is chosen because it would put disc road and rim brake road designs on a common standard. The industry’s current momentum favours 135mm for disc road almost as much as its inertia favours 130mm for rim brake road bikes. I guess it’s way to early to call this one. Faced with this quicksand of changing standards, the cynical consumer is tempted to see it as an industry conspiracy to force us to buy new wheels. True, manufacturers are trying to sell you stuff; that’s how they stay in business. But in this case, the wheel problems are a consequence of changes in other areas of components. The industry believes that you already want 11sp and/or disc brakes or will soon want it, so the industry chases after that sales goal. I only hope that there is enough harmony among manufacturers that they quickly and unanimously settle on some uniform standards while still allowing for backwards compatibility. When Campagnolo redesigned their cassettes and rear hubs for 9sp in the 1990s, there was zero cross-compatibility between 8sp and 9sp (and consequently 10/11sp). Today a wheel with an 8sp Campagnolo cassette hub is not a very serviceable hoop, since there are limited spare parts and a limited number of drivetrains for which it would be suited. It is not quite as utterly useless as a Heliocomatic hub or 6sp Uniglide Dura Ace hub, but it definitely is a dead end for future utility. At least when Shimano kept the same spline pattern to the 11sp cassette body, they ensured that consumers could use the hubs/wheels with their older drivetrains. In the short term, those of you not interested in upgrading your components or road bike need not trouble yourselves at all over wheels. But ride enough and you will probably need replacements for things such as tires or rims/wheels. No need to worry any time soon over conventional clinchers. Even if the tubeless trend continues, there will still be a massive selection of regular tires. Same for rims, except that the rims of wheel systems may swing towards tubeless. But the hubs will be able to take 10/9/8/7sp cassettes. And with 130mm OLD for the foreseeable future, those wheels will be compatible with the vast majority of road frames built after the 1980s. For those of you keen on the new 11sp systems from SRAM or Shimano, you’re going to need new rear wheels unless you already have Mavic wheels. If you want to take the leap into disc brake for road, you may as well just buy a complete bike. If you already have non-11sp compatible disc wheels, then you are kinda screwed if you wanted to go with the new 11sp & integrated hydraulic disc brake systems from SRAM and Shimano. You might try using a reduced 11sp cassette. There are some options to go to hydraulic and still keep your 10sp components. Finally, there are those of you out there with the patience to wait out the uncertainty until the design standards and conventions have settled. Especially if you want to wait until these high-end features trickle down into the mid and entry level, patience is the most economical route to disc brakes and/or 11sp. In about three years the road disc bike will be a solid segment of the market, and 11sp will be a feature of more budget-minded component groups like Shimano 105 and SRAM Rival. Ed. note: Mark V’s obsession with wheels runs as deep as the one for bikes.